The Wargrave Local History Society meeting in May was a most interesting talk by Geoff Horsnell about Shiplake Lock , and the role of a lock keeper. Geoff began by explaining that although most people would call him a 'lock keeper', he is properly called a 'lock and weir keeper' The control of the river takes precedence over all other aspects of his work. 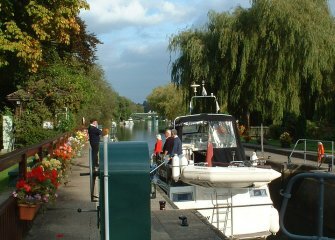 In the 136 miles of the non-tidal Thames from Cricklade to Teddington there are 44 locks, with 80 staff. They work a rota of 6 days on and 2 days off, throughout the year, but are also available at other times for weir work and emergencies. The Thames catchment area stretches as far north as Luton and as far south as Alton, and includes some 11,000 square miles, with many tributaries - including the Kennet, Loddon, Windrush, Wey, Ock, Cherwell, etc all feeding into the Thames. Even at the time of Domesday it is evident that there was control of water on the river, as millers had seen the potential for water power. Usually this was in the shallower areas, where it was easier to ford the river and construct dams, with removable sections to control the water flow. However, as river traffic increased, barges had to ask the miller to remove sections to enable navigation - and so 'flash locks' came into use - the last of which at Eaton Hastings was still in use in the 1930s. Boats going downstream would rush through when the lock was opened, whilst those going upstream would have to be winched through - one of this type of winch survives at Hurley Lock. This way of working the river resulted in a large loss of water each time a boat passed - and a lot of friction between the millers and bargees, who would be kept waiting - sometimes for weeks. This situation could not be allowed to continue, and so the Thames Commissioners came into being in the 1770s, to ensure the right of navigation could be maintained (from 1857, as the Thames Conservancy). By the early 1900s, all the locks on the Thames became fully manned. The river level is controlled at each lock to make sure there is enough water for navigation and for water extraction. The lock keeper has to judge how to regulate the water level to within prescribed limits. The tail gauge shows the level of water over the bottom sill of the lock, whilst the head gauge indicates the water level in the reach above the lock. The average drop along the river is 17" per mile. During the winter rains, a lot of water can come into the catchment area in a very short time, and its dispersal is controlled by adjusting the weirs. Each weir is different - as (from the days of the millers) each reach is different. At Shiplake there are large radials, with hand radials at either end, as well as a fish pass. The weir settings are sent by each lock keeper to the next lock downstream by phone, cascading the information along the river. Records are kept of all the settings, of rainfall, the levels on each gauge etc, and sent back to the flood control room. The staff also get information from the Met Office about the rainfall across their catchment area. In the winter, an inch of rainfall keeps them busy, but in summer the plants etc take up the water - if they release too much downstream, they cannot get it back above the lock again! It is never deliberately held back, however, to protect areas downstream - the aim is to maintain the required level, but sometimes nature increases the water in the river at such a rate that even if the weir were fully open it could not be got rid of quickly enough. Apart from regulating the water in the river, the other duties of a lock keeper include keeping records of the lock openings - on a busy summer weekend at Shiplake over 200 boats would pass, requiring 70 openings of the lock. In high summer, a summer assistant would help the lock keeper and his relief with the multiplicity of tasks like maintenance, cleaning, selling permits and tickets - and looking out for dangers on the river. Pre-Domesday records of Thames weirs and locks are scarce, but it seems there was a weir here by that time - but nothing further is known for 400 years, when a lock on the Thames is mentioned. By 1585, it belongs to The Crown, and Richard Cotterell was lock keeper, so for a long period thereafter it was known as Cotterell's Lock . In 1783 a new lock was built in fir wood, but this was rebuilt in 1787 in oak, as the fir had decayed. A mill is again mentioned in 1790, run by the Phillimore family, it catered for both paper and corn. The weir had originally been set at an angle to the river at the far western end of the lock island, but in the 1880s it was replaced by a new weir straight across the river, a little further to the east. When the larger milling firms took over the work, many mills fell into disuse, and Shiplake Mill was pulled down in 1907 - although some of the walls and sluice gear remain - and there is even still grease in the winding gear. Little change happened then until the 1950s, when the lock house - by then 150 years old - was replaced in 1958-9. For the first time, electricity and mains water were available, meaning the well and oil lamps were no longer needed. A lot of improvements took place in the 1960s, with new gates, lock office and weir radial gates. Shiplake was chose as a site to trial new hydraulic operation of the lock gates etc. These mean the lock can be operated much more quickly, and were such a success that all the locks from Godstow downstream have since been converted. The next set of changes came in 2009/10, when both sets of lock gates were replaced - on schedule despite the bad weather. The next meeting is on Tuesday, June 8th, (please note a correction to the date on the programme cards) when Michael Parsons - who was Managing Director at Brakspears Brewery - will tell us of the history of this famous local firm, whilst on Wednesday, July 7th, the Society will have a private visit to the Science Museum large exhibit store and archives at Wroughton. After the summer break, we meet again on Tuesday, September 14th when Marshall Barr, chairman of the Berkshire Medical Heritage Centre, will tell us about the history of The Royal Berkshire Hospital.